Jazz trumpeter Andy Urquhart and his House Band from the Jazz Café at Sandbanks left their regular Sunday spot in Poole recently to perform at Brockenhurst College’s Kemball Theatre. 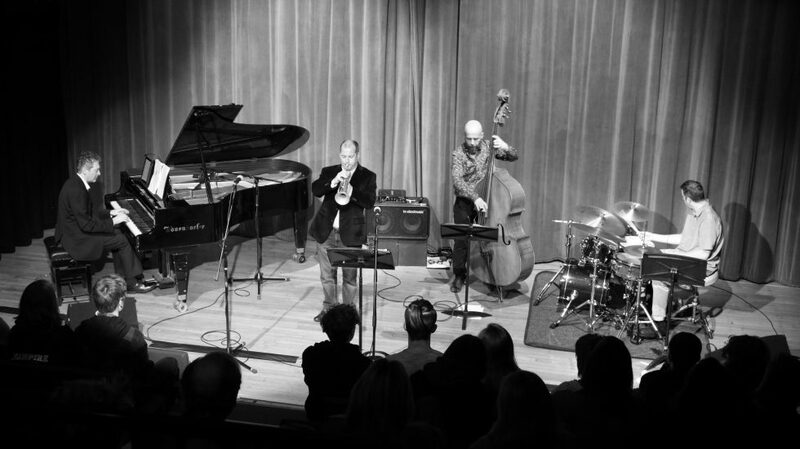 The quartet – Andy Urquhart on trumpet, Andrew Daniels on piano, Lee Miller on drums and Brett Nevill on double bass – performed a range of contemporary and modern jazz pieces to a packed house. The audience included current A Level and BTEC Music students who have been studying jazz music as part of their courses. Brock staff and members of the public also attended, as well as prospective students who had recently auditioned for the College’s music courses. The Jazz Café House Band regularly collaborate with top UK jazz names such as Gilad Atzmon, Liane Carrol, Ian Shaw, Jim Mullen and Tina May. As a result, audience members gained a unique opportunity to witness the current sound and vibe of the UK jazz movement. Head of Performing Arts Tara Gadd said: “We’re very pleased to be able to host high-quality professional acts for the benefit of our students while also opening up our theatre to the wider public. “The evening gave our prospective students a really good insight into the vibrant musical community associated with our Performing Arts department, and gave our current students a quality insight into the work of a modern professional jazz band,” she added.